The dynamically increasing number of domain name registrations across all domains available was close to 300 million, according to the report. Over the period of the third quarter the number of registrations has grown by 1.6% compared to the previous quarter. For the most part, the market was shared between ccTLDs (such as .DE, .ME, .UK, etc.) and legacy TLDs (such as .COM, .NET, .ORG) at 46% and 51.4% respectively, with new gTLDs (like .CLUB, .BERLIN, .DATA) making up for the remaining 2.6%. 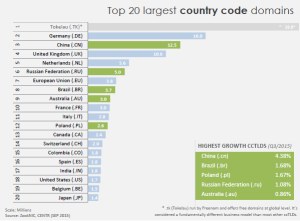 Across country code domains (ccTLDs) in the third quarter of 2015, Chinese domain .CN demonstrated the highest growth of 4.38%, followed by .BR (Brazil) and .PL (Poland) with growth percentages of 1.68% and 1.67% respectively. The largest ccTLD, aside from .TK, continued to be German domain .DE with the total number of registrations of about 16 million. .CN (China) came in second with 12.5 million registrations and .UK (the United Kingdom) was in the third position with 10.6 million registrations. The Colombian domain .CO advanced from the fifteenth place to the thirteenth owing to its growing popularity as an alternative to .COM. The combined number of domains under management across European domains in Q3 was almost 68 million. The renewal rate of about 85% was maintained within the stable range over the past few years. 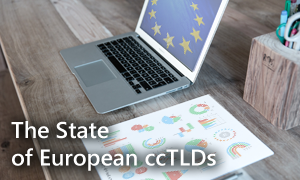 On average, European countries tend to prefer local ccTLDs (61%) over Legacy gTLDs and new gTLDs. The total number of domains within Legacy TLDs was about 153.5 million (.COM constituting about 80% of this) at the end of the third quarter showing the growth of about 1%. 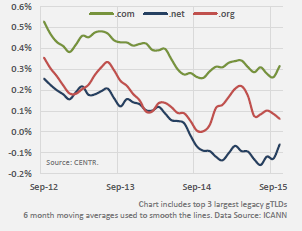 The chart below illustrates the continued growth of top three Legacy TLDs over the period of the last three years. New generic Top Level Domains (new gTLDs) combined showed growth of 30% in the third quarter, according to the report. This TLD segment is beginning to show signs of increasing impact on the domain market and higher penetration rate. At the end of September 2015, .XYZ topped the new gTLDs list with over 965,000 registrations followed by .TOP with about 538, 000 registrations and the Chinese IDN .网址 (xn—ses554g) with around 699,800 domains. The changing face of the Internet following the introduction of new gTLDs, encourages competition and offers more choices to domainers as well as visitors. There are more opportunities than ever to mark your Internet presence and increase your online visibility. Just click on the TLD of your choice and use our search tool to check if the name you have selected is available for registration. If you need help, write to us at support@web-solutions.eu or phone us on +44 (0) 208 133 3994.